Rick Browne is a writer, photographer, pitmaster, restaurant critic and consultant. He is also the author of Grilling America and The Frequent Fryer Cookbook (Regan Books, NY) and coauthor of The Barbecue America Cookbook (The Lyons Press, 2002). As a renowned grilling and barbecue expert, Browne is one of only a few in the U.S. to receive an honorary Ph.B (Doctor of Barbecue Philosophy) bestowed upon him by the prestigious Kansas City Barbeque Society for his expertise and commitment to barbecue. As an award-winning photojournalist, Rick has more than 25 years of assignments to his credit. His writing and photography assignments covering breaking news, travel and culinary subjects span the globe and have been published in a variety of domestic and foreign magazines, including Time, Newsweek, People, USA Today, Canadian Living, Islands, Travel Holiday, Reader’s Digest, Maclean’s, Sunset, Burda, United Airlines’ Hemisphere, Wine Spectator, Geo, Diversion, Saveur, Saturday Night and Travel & Leisure. Rick has appeared as a barbecue expert on many television programs, including The TODAY Show, Live with Regis & Kelly (three times) and CNN, and has been featured in People and USA Today. In addition, over the past year he has been the focus of numerous articles in both print and broadcast media during his 30,000-mile road trip in his customized “BARBECUE AMERICA” motorhome with his wife Kathy to promote his books and television program. Born in Brantford, Ontario, Canada, Rick Browne has spent the past six years researching barbecue across the United States and Canada by visiting festivals and barbecue restaurants and interviewing dozens of pitmasters. In his frequent role as an editorial food photographer, Rick has worked with the world’s greatest chefs, including Julia Child, Jacques Pepin, Paul Bocuse, Giuliano Bugialli, Marcella Hazan, Jeremiah Tower, Joachim Splichal, Charlie Trotter, Susan Spicer and Roger Verget. His culinary photographs have been published in most of the world’s leading food and wine magazines. 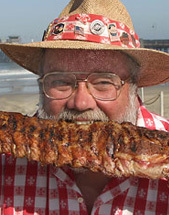 Rick is a member of the International Association of Culinary Professionals, the Canadian Barbecue Smokers Association, the National Barbecue Association, the International Bar-BQue Cookers Association, the Kansas City Barbeque Society, the new Western BBQ Association and the World Barbecue Association and is a founding member of the California Barbecue Association. As a KCBS-certified barbecue judge, he has judged at the Kansas City Royal, Blue Springs Invitational, Portland’s Bones-n-Brew, Memphis in May and the Jack Daniel’s World Championship Invitational barbecue contests. Rick and his wife of 26 years, Kathy, are the proud parents of four grown children and two grandchildren and share their Vancouver, Washington home with their devoted pets Spats the dog and Spoons the cat and, of course, their 15 barbecue grills!